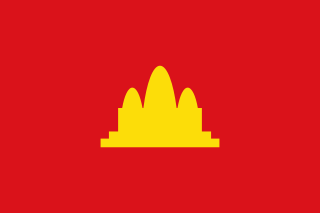 The KUFNS revived the flag adopted by the Khmer Issarak in the days of anti-French resistance, declaring it the flag of the PRK. The December 2 Memorial Monument to commemorate the establishment of the Solidarity Front for the Development of the Cambodian Motherland (SFDCM). Its foundation took place on 2 December 1978 in Kratié Province near the border with Vietnam at a meeting of seventy dissident Cambodians determined to overthrow Pol Pot's government. Heng Samrin was voted as leader of the front and within a few weeks its influence spread widely on both sides of the border. 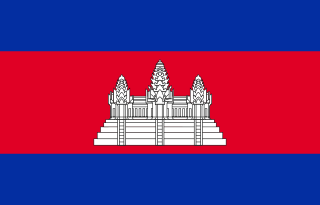 The front was a heterogeneous Cambodian politico-military organization that legitimized the Vietnamese invasion of Cambodia, precipitating the ensuing defeat of the Khmer Rouge's Democratic Kampuchea. It brought about the foundation of the new state named 'People's Republic of Kampuchea' and the reconstruction of the shattered and desperately impoverished country. This organization has undergone various name changes as it has expanded and adapted to the different historical realities in Cambodia. Kratié or Kraches is a province (khaet) of Cambodia located in the northeast. It borders Stung Treng to the north, Mondulkiri to the east, Kampong Thom and Kampong Cham to the west, and Tbong Khmum and Vietnam to the south. Central Committee of FUNSK consists of 15 members, Heng Samrin as Chairman, Chea Sim as vice president, Ros Samay as secretary general. Revolutionary People's Council decreed on January 8, 1979: Heng Samrin (Chairman), Vice Chairman: Pen Sovan. Headed by Heng Samrin, Revolutionary People's Council of Kampuchea includes Hun Sen (Foreign Affairs), Keo Chenda (Culture and Information), Mot Sakun (Economy), Chea Sim (Interior), Pen Sovan (Defense), Nu Beng (Health and Social Affairs), and Chan Ven (Education). Chea Sim was a Cambodian politician. He was President of the Cambodian People's Party from 1991 to 2015, President of the National Assembly of Cambodia from 1981 to 1998 and President of the Senate from 1999 to 2015. 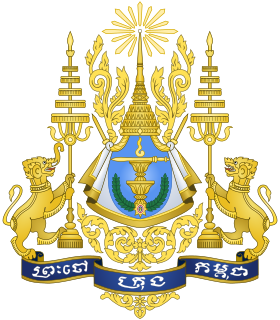 His official title was Samdach Akeak Moha Thomak Pothisal Chea Sim, Protean Protsaphea ney Preah Reacheanachak Kampuchea. Heng Samrin is a Cambodian politician who was the de facto leader of the Hanoi-backed People's Republic of Kampuchea from 1979 to 1981 and General Secretary of the Kampuchean People's Revolutionary Party from 1981 to 1991. He has been the President of the National Assembly of Cambodia since 2006; he is also Honorary President of the Cambodian People's Party (CPP) and a Member of Parliament for Tboung Khmum Province. Heng Samrin is Cambodia's oldest parliamentarian, at 84 years of age. His honorary title is "Samdech Akeak Moha Ponhea Chakrei Heng Samrin". Pen Sovan was a Cambodian politician who served as the Prime Minister of the Hanoi-backed People's Republic of Kampuchea from 27 June to 5 December 1981, and was General Secretary of the Kampuchean People's Revolutionary Party (KPRP) from 1979 to 1981. He was arrested and removed from office in December 1981 by the Vietnamese for irritating Lê Đức Thọ, the chief adviser to the PRK government. He was imprisoned in Vietnam until January 1992. In 1981, two years after the liberation of Phnom Penh, the Salvation Front was renamed "Kampuchean United Front for National Construction and Defence", Front d'union pour l'édification et la défense de la patrie du Cambodge (KUFNCD or UFCDK). 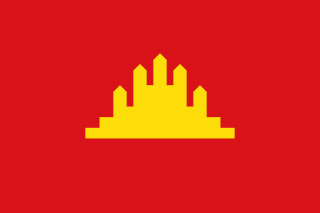 Years after the establishment of the People's Republic of Kampuchea, the Front remained as the main political organization of the pro-Hanoi Cambodian state. The front's role in the political life of the nation was officially established in the PRK Constitution, which stated in Article 3 that "The Kampuchean Front for National Construction and the revolutionary mass organizations constitute a solid support base of the state, encouraging the people to fulfill their revolutionary tasks." This organization, so important in its heyday, has lost much of its original relevance in Cambodian present-day politics. The Front's specific missions were to transmit party policies to the masses, to act as an ombudsman, and to mobilize the people around the regime's efforts to consolidate the so-called "worker-peasant alliance." The front's cadres were required to stay in close touch with the people, to report their needs and problems to authorities, and to conduct mass campaigns to generate support for the regime, or to lead "emulation" drives to spur the population to greater efforts in pursuit of specific goals. The Front also was responsible for conducting "activities of friendship," which were aimed at improving the climate for close cooperation with "the Vietnamese people and the Vietnamese army and experts." Another major function of the front was to reeducate Buddhist monks so that they would "discard the narrow-minded views of dividing themselves into groups and factions" and would participate more actively in the revolutionary endeavors of the Salvation Front. Presently the Solidarity Front for Development of the Cambodian Motherland (SFDCM), the Salvation Front's latest avatar, organizes national and international events, such as sports venues and trade fairs on behalf of the Cambodian government. Kampuchean Federation of Trade Unions (KFTU). It had 62,000 members in December 1983 and was officially described as "the training school of the working class for economic and administrative management". Kampuchean People's Revolutionary Youth Union (KPRYU), an important reservoir of candidate members for the KPRP and "a school of Marxism" for people between the ages of fifteen and twenty-six. As of March 1987, when the Youth Union held its Second National Congress, there were more than 50,000 members in villages, factories, enterprises, hospitals, schools, public offices, and the armed forces. Kampuchean Revolutionary Youth Association (KRYA), an 800,000- member group for children (aged 9 to 16). Kampuchean Young Pioneers Organization (KYPO), a 450,000-member group for preschoolers under the general guidance of the KPRYU and the KRYA, both part of the Pioneer movement. Kampuchean Revolutionary Women's Association (KRWA), which claimed 923,000 members as of October 1983. 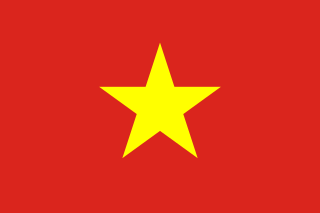 Kampuchea-Vietnam Solidarity Day on 18 February. Day of Remembrance observed on 20 May. Day of Solidarity between the People and the Army celebrated on 19 June. Gottesman, Evan, Cambodia after the Khmer Rouge: Inside the politics of Nation Building. 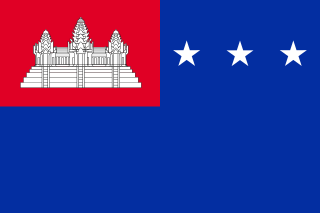 Party of Democratic Kampuchea was a political party in Cambodia, formed as a continuation of the Communist Party of Kampuchea in December 1981. In the mid-1980s, it publicly claimed that its ideology was democratic socialism, having ostensibly renounced communism. 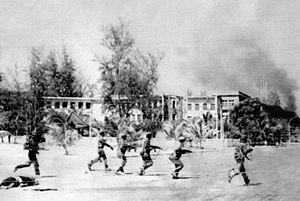 The Cambodian–Vietnamese War, otherwise known in Vietnam as the Counter-offensive on the Southwestern border, was an armed conflict between the Socialist Republic of Vietnam and Democratic Kampuchea. The war began with isolated clashes along the land and maritime boundaries of Vietnam and Kampuchea between 1975 and 1978, occasionally involving division-sized military formations. On 25 December 1978, Vietnam launched a full-scale invasion of Kampuchea and subsequently occupied the country and removed the Communist Party of Kampuchea government from power. The Khmer People's National Liberation Front was a political front organized in 1979 in opposition to the Vietnamese-installed People's Republic of Kampuchea (PRK) regime in Cambodia. The 200,000 Vietnamese troops supporting the PRK, as well as Khmer Rouge defectors, had ousted the brutal Democratic Kampuchea regime of Pol Pot, and were initially welcomed by the majority of Cambodians as liberators. Some Khmer, though, recalled the two countries' historical rivalry and feared that the Vietnamese would attempt to subjugate the country, and began to oppose their military presence. Members of the KPNLF supported this view. Chan Sy, also spelt Chan Si, was a Cambodian politician. He became Prime Minister of the People's Republic of Kampuchea from 1982 to 1984. Yos Por, a Cambodian communist politician. Tou Samouth, also known as Achar Sok (អាចារ្យសុក), was a Cambodian Communist politician. 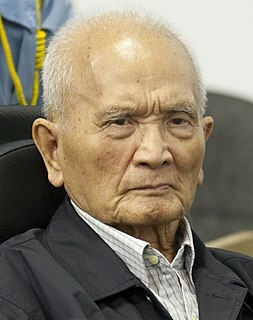 One of the founding members of the Party in Cambodia, and head of its more moderate faction, he is mainly remembered for mentoring Saloth Sar, who would later change his name to Pol Pot. The K5 Plan, K5 Belt or K5 Project, also known as the Bamboo Curtain, was an attempt between 1985 and 1989 by the government of the People's Republic of Kampuchea to seal Khmer Rouge guerrilla infiltration routes into Cambodia by means of trenches, wire fences, and minefields along virtually the entire Thai–Cambodian border.